So, you want some of your classic sci-fi shows on Blu-ray? How do they do that you may ask? Well, in many cases it depends on when and where the show was created. In the 1950s through the mid 1980s, U.S. science fiction TV was shot entirely on film. Classic shows like The Twilight Zone, The Outer Limits, Star Trek, Night Gallery, Kolchak: the Night Stalker, The Six Million Dollar Man, Wonder Woman, Battlestar Galactica, The Incredible Hulk, Buck Rogers and V: The Series all had the Hollywood look. Effects were done on film, practical where necessary, optical as required. Then in 1986, Star Trek: The Next Generation started its seven year run. This series initiated a revolution in special effects. While live action was still caught on film, wholly special effects scenes depicting the Enterprise and the various ships and worlds it encounters would often be generated on video with the use of computer graphics imagery (CGI). CGI would often make its way into the live action as well. Unfortunately, these images would be constructed in standard definition. This method of production continued for almost two decades, every Star Trek series (except the last season of Enterprise), Babylon 5, Farscape, Firefly, The X-Files, Hercules and Xena used this method. Even though the Apple II was very long in its lifespan by the end of the 1980s, there was a fair bit of software still being released for it. The Apple II was very strong in the educational market, computer labs across the United States had yet to upgrade to the PC platform. The Apple II had many, many classic games. Most of them were ported to the PC at some point, but by the end of the 1980s the number of A2-to-PC ports (that did not have the name Carmen Sandiego in the title) was dwindling. Even so, two classics of the Apple II did make their way to the PC platform in the late 1980s and they are the subject of this blog entry. The first is MECC's 1985 update of The Oregon Trail. The second is Jordan Mechner's Prince of Persia, programmed on and released for the Apple IIe, IIc and IIgs in 1989. MECC ported the Apple II version of The Oregon Trail to the IBM PC in 1988. Mechner and Broderbund ported the Apple II version of Prince of Persia to the PC compatibles in 1990. The Oregon Trail is the simpler game, in fact it was an update of an earlier version MECC made for the Apple II in 1980. That version was mostly text-based and occasionally displayed simple wire-frame graphics and a little music. Before personal computing, Oregon Trail was played on mainframes on a time-share basis. But the 1985 Apple II version is undoubtedly the most popular version of the game. The 1985 version requires 64KB of RAM on an Apple II. This version was ported to the PC by MECC in 1988. The PC port requires 512KB of RAM and at least a CGA card. Prince of Persia is a spiritual successor to Mechner's Karateka, another big hit. Both were published by Broderbund. Prince of Persia takes the rotoscoped graphics and one on one combat of Karateka and combines them with running and jumping mechanics, obstacles, traps and triggers. It requires 128KB of RAM and an Apple IIe capable of displaying double high resolution graphics, a IIc or a IIgs. It only uses double high res graphics on the title screen and story text screens (four screens). Mechner supervised the ports of the game to the IBM PC compatibles and the Amiga in 1990. It supports CGA, Hercules, Tandy, EGA and VGA and a variety of sound cards and 512KB-640KB depending on the graphics mode. When it came to porting these games to the PC, MECC did an outstanding job. Broderbund and Mechner, not so much. The PC Speaker was the first audio device that PCs used. In some form or another, it is contained in almost every PC ever made. In the original IBM PC, the Model 5150 released in 1981, the speaker was a distinct cone 2.25" in diameter. And it was loud, but it had to be in order to compete with the noisy power supply fan and the seeking of the disk drives! The tones it output were pure, and while they were rather harsh they were also clear. When emulators like DOSBox became mature, they could easily output basic PC Speaker audio. Basic PC Speaker audio is essentially a square wave with a fixed volume level and a 16-but frequency selector. They can have difficulty with the more complex sounds produced by Pulse Width Modulation, which essentially sends changes to the frequency of the square wave to the speaker faster than the speaker cone's driving circuitry was intended to handle. This requires a much more rigorous emulation of the CPU, the timer and the "analog" characteristics of the audio generation. There is a myth that the AV Famicom is too quiet when it mixes internal audio with external audio. The myth goes that the external cartridge audio drowns out the internal audio from the console and gives an unbalanced and unfair impression of what the programmer intended the music and sound effects to sound like. The conclusion is that an original Famicom, preferably an earlier model, is the ideal way to experience Famicom audio. However, this conclusion is too simplistic and the internal/external mix is not as extreme on standard Nintendo Famicoms and AV Famicoms as one may be led to believe. Of course Famicom audio has its own problems. The first problem is that genuine Famicom audio is encoded into RF and decoded in a TV. The baseline audio has a buzz and the output of the audio sounds like it was run through an oppressive low-pass filter. The second problem is that playing a Famicom with its RF video and hardwired controllers is something of a chore. The earlier Tandy 1000s, the 1000, 1000A, 1000 SX and 1000 TX came with a 90-key Tandy Keyboard. The Tandy 1000 EX and HX had the 90-key Tandy Keyboard built in. This keyboard uses its own communications protocol and timing and is not compatible with an IBM PC, XT or AT or their clones. This keyboard uses an 8-pin DIN plug. The later Tandy 1000s from the TL and SL onward came with 101-key keyboards. These keyboards, called the Tandy Enhanced Keyboard, were an autoswitching keyboard that could work in an IBM PC, XT, AT or their clones. This keyboard uses a 5-pin DIN plug and do not work in an earlier Tandy 1000. In the technical reference manuals for the TL and SL, which are the last Tandy technical reference manuals available online, the keyboard controllers do mention Tandy 1000 Keyboard compatibility. These computers have a 7-pin DIN connector even though an XT or AT keyboard only uses four pins. The schematics indicate that the extra pins are used for Tandy 1000 keyboard-specific signals. Sometime ago, I acquired an 8-bit ISA card called the Epson MGA Q205A. 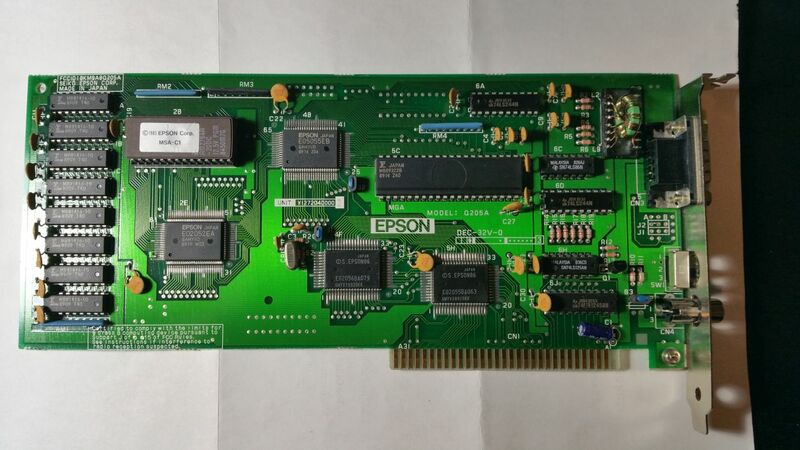 I figured it was a CGA compatible card because it had one DE-9 female port and one RCA jack, which the standard CGA configuration. The only unusual thing about the card was a two-position switch on the bracket plate. The switch is labeled color/mono. I couldn't find anything about the card in Total Hardware '99. I noted that the card displays in color on startup instead of B&W on a color composite monitor, I figured the switch was there to turn it to B&W. An IBM CGA displays in B&W on startup in an IBM PC or XT. After testing the card out a bit, I was pleased that it gave composite colors reasonably close to an IBM CGA card. I was also pleased that the card is less than 10", meaning it will fit inside a Tandy 1000 computer. However, Trixter's CGA Compatibility Tester demonstrated that the CGA compatibility was weak when it came to the 6845 tests. This is not particularly surprising when I determined that the card does not have a 6845 CRT Controller onboard. Since I have three IBM CGA cards, the card rarely has surfaced in my thoughts. I have had the privilege of being lent a Northgate Omnikey 101 keyboard. This keyboard is identical to the layout of my IBM Model M keyboards. I am going to first identify the features of each keyboard and then give my impressions of the Northgate compared to the Model M.
Model M's use PBT plastic on the top and bottom enclosures, on the key caps and the key stems. For this reason Model M do not yellow through exposure to ultraviolet light. On the other hand, PBT can be somewhat brittle and it is not a rare thing to see cracked keycaps on a Model M. Because keycaps come off very easily, it is often the case that you will find a keyboard for sale with one or more missing. The enclosure is held together with hex screws requiring a long-barreled 7/32" driver to access. Later Model Ms, mostly made by Lexmark and Unicomp, often have drainage holes cut into the bottom half of the enclosure for liquid spills, but the IBM-made keyboards rarely have them. Used primarily to trade stocks and for betting on horse racing. Also includes a barcode reader in the main unit to read special cards which would come with the games. Cartridges use a proprietary form factor and are inserted into the base unit.